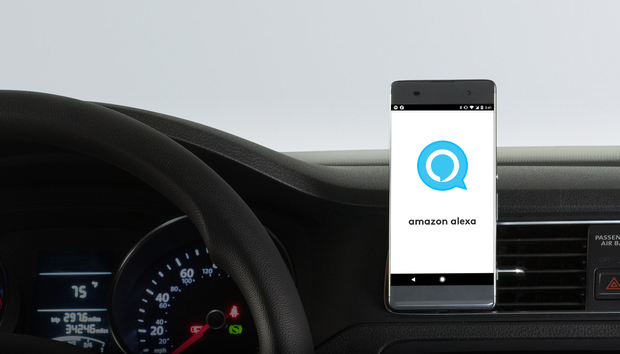 Logitech has announced a new version of the app for its ZeroTouch Android smartphone mounts (there is no iPhone version) that incorporates Amazon’s Alexa voice-controlled digital assistant. Once ZeroTouch owners install the new app, they’ll gain a raft of new features, including the ability to control any Alexa-compatible device in their smart home, even if they don’t own an Amazon Echo or Echo Dot. The ZeroTouch itself is available in two configurations that enable hands-free control of a docked smartphone. The ZeroTouch Air Vent ($59.99 at Amazon) clips to one of the car’s air vents, while the ZeroTouch Dashboard ($79.99 at Amazon) mounts to the car’s dashboard or windshield. Both models have Bluetooth radios that automatically launch the ZeroTouch app when the phone comes into contact with the mount. When you present your palm to your phone’s proximity sensor, the ZeroTouch app listens for your voice command. Say “Alexa,” and you can access any of the 8,000 skills associated with Amazon’s digital assistant. Logitech’s ZeroTouch automobile smartphone mount has a battery-powered Bluetooth radio onboard. That includes getting weather forecasts, adding items to your shopping list, and listening to your Kindle books. And if you have Alexa-compatible devices at home, you can now control them from your car. So if you want to make sure your home is at a comfortable temperature when you get home, you can tell Alexa to change the target temperature on your smart thermostat. Or if it’s dark when you get home, you can tell Alexa to turn on your smart lights before you get out of the car. The impact on you at home: If you already own a ZeroTouch (you can read more about them in this Greenbot story), the addition of Alexa skills is a fabulous new feature for something you’ve already paid for. The list of Alexa-compatible smart home products is long and keeps growing. It’s also worth repeating that you don’t need to have an Echo or Echo Dot at home in order to take advantage of Alexa skills (although you’ll only be able to take advantage of them while you’re in your car if you don’t). Logitech sent us a ZeroTouch to check out, so we’ll have a full hands-on review soon.